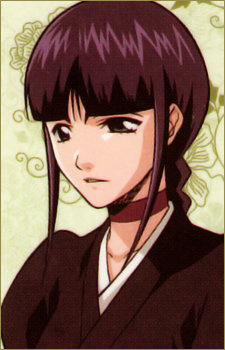 Nemu is the lieutenant of the 12th Division in the Gotei 13, under captain Mayuri Kurotsuchi. Nemu is the artificially created daughter of Mayuri Kurotsuchi, a combination of his research in artificial bodie and artificial souls. This past has driven her to become rather introverted and melancholic, preferring to stay silent in her captain's presence. Their relationship is far from the average father-daughter one, as Mayuri doesn't seem to care much for Nemu's well-being (using her as bait in combat). The most that can be said in his favor is that he has occasionally implied concern over her life as a point of personal pride in his own skill as her creator. Despite being abused and mistreated in every possible way by her captain and father, Nemu still shows great loyalty to him, and has openly expressed worry at the prospect of his death, likely due to her implied gratitude that Kurotsuchi brought her into the world. Unlike her father, however, she seems to have compassion for others, saving Uryū Ishida's life as a thank you for not killing Mayuri. Based on the 13 squad episode endings and the Bount arc, Nemu's fighting style seems to be a combination of capoeira-like martial arts, and kidō attacks. Nemu's body was designed to withstand fatal injury, though still suffers the pain brought on by her injuries. This extends to being able to survive impregnation by Szayel Aporro Granz, a process meant to bring him back to life while leaving his host as an empty husk. Mayuri can repair Nemu very quickly in these situations, allowing her to continue doing her father's bidding. Nemu is also immune to Mayuri's many poisons. Despite this, she carries around a variety of antidotes to be used as she sees fit. She also holds various poisons and potions derived from Mayuri's research in her own body, making her highly dangerous to those that attack her internally. Nemu does not normally carry a zanpakutō, but she is revealed to have one in an illustration in the artbook "All Colour but the Black." Her zanpakutō takes the form of what appears to be a thin katana.